Every year our family travel together to Germany for a company meeting, and to host the annual Summer Academy. Here we have learned how in Germany, especially in Berlin, the community can reflect on the past in order to participate in the present and better navigate the future. Our family is always struck by the many museums and events that looks not only at German history, but also mistakes and darker periods in Germany’s past. Imagine we could do this in South Africa? Would that not allow us to have a more meaningful discussion of our past, to help us understand how we are all shaped by decisions, actions and influences from the past? What would the Union Buildings tell us? there are several light sources. Video footage, shadows and colors are projected onto several buildings, while music from Paul van Dyk (Wir Sind Wir) and Die Toten Hosen (Tage Wie Diese) fades in and out around the narrative. When the narrator talks about the wall, a spiked fence shadow is projected over one of the facades (see picture above), while later the whole building is behind barbed fence. the sound is amazing, even if the narrative is in German. the people we take with us are touched by the footage, even if they don’t understand a word. These are typically participants in the Mesopartner Summer Academy from many developing countries where they too tend to sweep past decisions under the carpet. this display also reveals something about the German culture that we admire, the ability to debate, discuss and deliberate in a very transparent way. Even if it is about taboo decisions. we get the idea of one nation, even there are different opinions. Even if this is expressed in German. Head over to Youtube. Here is one link to a show recorded in 2016. Here is another link. Alternatively, search for Film- und Licht­projektion im Parlaments­viertel. If you have seen the show, share your thoughts, your photo or your impressions. Some German translations of some of the text would also be welcome! During July 2018 I visited Prague with my family. In the parks they had pianos that people could simply play on. They were tuned. And no, they were not bolted down! For us South Africans the idea that something as expensive as a piano can stand in a public space is just mind-boggling. Then the finer details, like the paving, a chair and nice roof. Bring back the ox and plough….Are you serious? This morning I read the announcement by the Director General of Rural Development and Land Reform, Thozi Gwanya, that small and rural farmers should revert to the proven method of ploughing with oxen. My first response was “oh, come on! This is 2010!!!”. While making coffee to recover from my initial shock I started to doubt my own response. visited several rural farms where land transfers are taking place, where farmers were sitting on un-used lands because they were waiting for a ‘tractor’ contractor. The same happens with small farmers supported by several municipalities. So in these cases, using oxen to plough would already be a step in the right direction. However, then the Director General motivates this advice on the basis that using a tractor to till a small piece of land will emit to many gases. I am not so sure that many poor farmers would just give up farming with a tractor on this argument alone…. Furthermore, the news article makes reference is made to India. 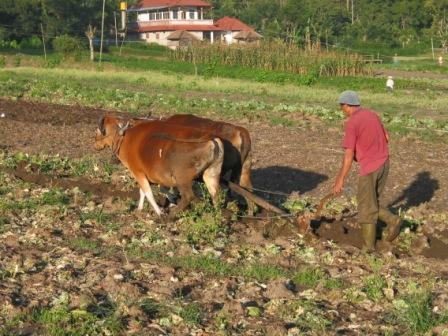 Well, I have seen farmers ploughing with oxen in Thailand and Indonesia as well. As long as they can keep their production costs below market prices, I guess it is worth pursuing. A huge visible difference between Southern Africa and Asia is that farmers in Asia seem to get by with extremely little government support, agricultural extension and modern farming equipment. OK, so now that I have my cup of coffee in my hands I am willing to reconsider my initial response. Perhaps the Director General should have said “instead of waiting on someone else, use oxen!”. Can any of the readers of this blog with more experience in rural development perhaps comment or contribute on this issue? Posted on February 3, 2010 November 1, 2017 Author Shawn CunninghamCategories Globetrotting, Thinking out loud7 Comments on Bring back the ox and plough….Are you serious?